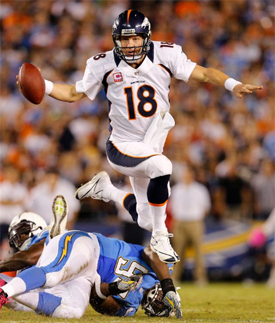 After being on the road last week to get the big win over the Dolphins the Broncos return home for Orange Sunday against the floundering Detroit Lions. The Lions after starting the year off hot have frizzled in recent weeks and are now struggling with key injuries. The Lions starting QB Stafford is likely out with an ankle injury and that could mean Shaun Hill may play. Either way the Lions biggest weapon Calvin 'Megatron' Johnson is hoping for a big day against our secondary. This will be the most important match up, will Champ be able to do a number on Johnson and take him out of the game or will Johnson have a big game? You will have to watch and find out. Tim Tebow basks in the glory of his home crowd, while Ndamukong Suh, after being called dirty by the Falcons last week, leads a scary pass rush against him. The Lions can't afford to lose three in a row after a dream start, and Matthew Stafford is facing injury questions again. Can Tebow continue the heroics against a better opponent? Detroit plays the run on the way to the quarterback, and if Tebow can make a quick cut and get by the first wave of linemen, there could be some fertile running lanes. The Lions are poor against the run. I still would like to see Larsen get more involved in the offense. The play calling, with McGahee out a few more screens and runs outside to get Knowshon in space would be nice. Also some boot-legs and play action passes would be nice. Tebow have a complete game, play well for most of the game and complete passes. Decker, Thomass'(?) and Royal getting open and making plays. 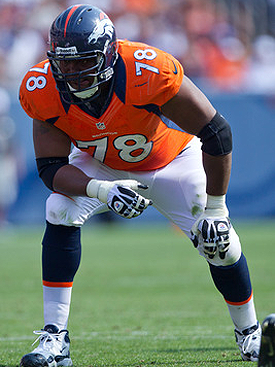 Less then 6 sacks, the line needs to protect Tebow more. For defense, turnovers and sacks. The more times they can get the ball for Tebow the better. And of course Champ Vs Megatron, that will be a big matchup. A new form of photos that has over taken Planking, Tebowing. 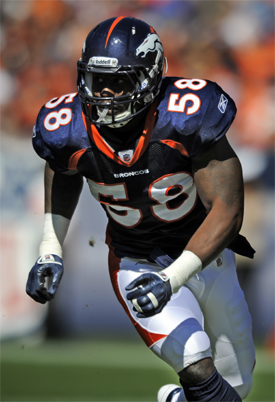 Some of the photos are really good, even Von Miller has gotten in on the act. You can now vote for the pro bowl, so do it. Vote now and often! Little David is in the 5th grade. Yesterday morning when the teacher asked the children what their fathers did for a living, all the typical answers came up: fireman, policeman, salesman, etc. The teacher noticed that little David was being uncharacteristically quiet and so she asked him about his father. "My father's an exotic dancer in a gay bar and takes off all his clothes in front of other men. Sometimes, if the offer's really good, he'll go out to the alley with some guy and do it with him for money." "No," said David, red faced. "He plays for the Detroit Lions, but I was too embarrassed to say that in front of the other kids." Q: Why did the NFL award Super Bowl XL to the city of Detroit? A: Because they felt bad for the Lions, figuring it was the closest the team would ever come to a Super Bowl. 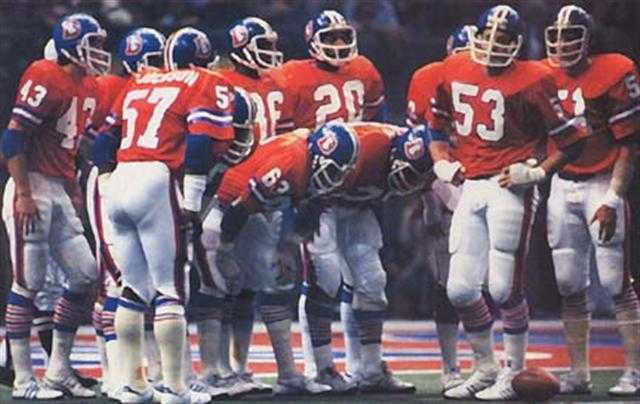 That is it for me, enjoy Orange Sunday and cheer on the Broncos! ~ Aussie. Here are the nominees so far for the honor wall. So can we agree on the top 5 or should we create a poll for people to vote on? I got another. Joe Mays. I say poll. lol that's a funny picture of Tebow. Now that I see Joe Mays' name, that would be a good one to put up too so I guess I have to say put up a poll too. But I think Tebow is a given even though he's only begun. I say put up a poll & the 4 highest votes go on the wall with him. I think its safe to say he'd steal everyone else's thunder in votes so just give it to him & vote on the other 4. Ok poll it is, I will make it so u can select multiple people, and I will add Joe mays. 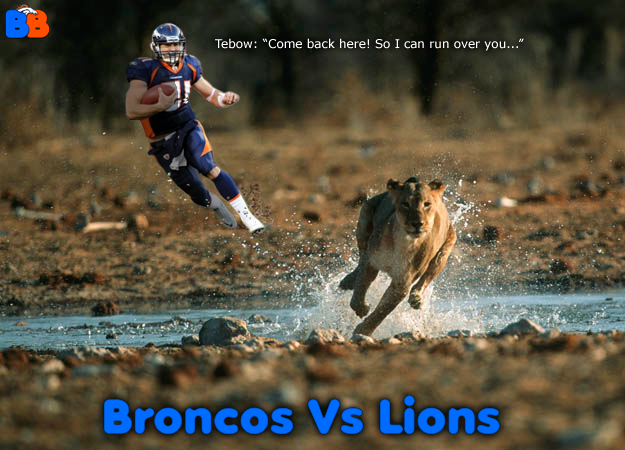 The Lions are running scared from 'The Tebow'. Haha. 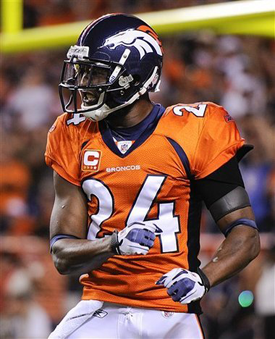 That made me think, the Broncos and Champ Bailey should be running scared of Megatron. So pumped for this game, hopefully it is a good one. Go Broncos! Game day and I am pumped even though I will have to watch it on the computer again. I think we have a shot today at a win. If KC could manage a win vs. SD to go along with our win we would be one game back from all three of the other teams in the division. Just ugly, no run game, no pass game, no blocks, I only saw Tebow go to his second read once and that was because he was pressured all day. Franklin struggled big time. Defense was ok but the few times we blew coverage we paid for it. Give credit to the Lions, they played really well and showed why they are a good team and we are not. Tebow showed us Tebow, he is still learning. Towards the end of the game Tebow showed he can complete the short passes.